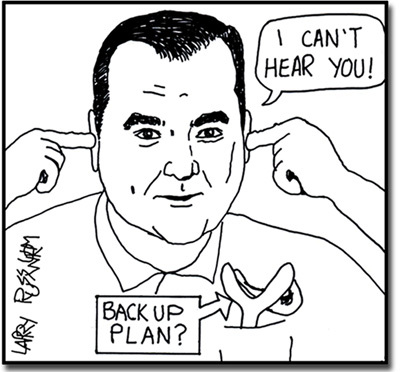 Heritage minister, James Moore, is depicted above. You may ask, “Why did he get Cartoond?” Well mainly because he chooses not to listen to Canadians. On Twitter, he blocked my sister, Laurie, since he decided any critique by her would no longer be valued. Her article can be found here. Laurie joins a cast of over 60 Canadians that are blocked by James Moore on twitter. The rest of the lineup can be found here. The first case of being blocked (that we know about), Russell McOrmond, explains himself here. So, for many reasons, James Moore got Cartoond. This entry was posted in Art, Cartoon, Humour, Music, Politics, Stage and Screen, Writing and tagged Canada, cartoond, copyright, Harold Albrecht, Heritage Minister, James Moore, Laurie Russwurm, Russell McOrmond, Twitter. Bookmark the permalink.